Windows with innovative aluminium overlays. 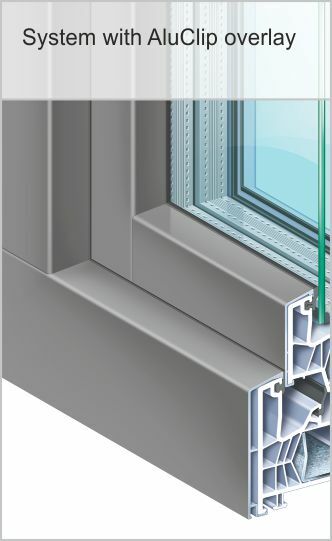 Specially constructed aluminium overlays for window and door PVC profiles is the innovative solution of excellent technical parameters, as the beneficial alternative for aluminium windows. Aluminium is distinguished by elegance, best resistance to changing atmospheric conditions, high stability, simple cleaning and indefinite colour range – thanks to the techniques of ennobling external surfaces, i.e. anodizing or powder coating. PVC guarantees optimal thermal and acoustic insulation and high functionality. KÖMMERLING 76 offers the exceptional combination of benefits given by aluminium and PVC implemented in Alu Clip, Alu Clip Pro and AddOn innovative systems. Our solutions provide for indefinite design possibilities and our windows meet highest requirements of energy-efficiency!